This poem addresses the primary duty of believing parents as the world unravels right before us. Please read and share freely to bless the body of Christ. The grace of our Lord Jesus be with you. This poem addresses the primary duty of believing parents in this age. Thank you, Joy! You are blessed! Thank you so much and remain blessed! Thank you, Ifediora. Hope you've been fine. Stay blessed and rapturable! How many are ready to take up these responsibilities of teaching the younger generations the best way to follow,the situation is quite pathetic,God help us. Thank you Ma! nice composition,2 thumbs up Ma. Nice write up Ma. This is true it is backed up by the bible. 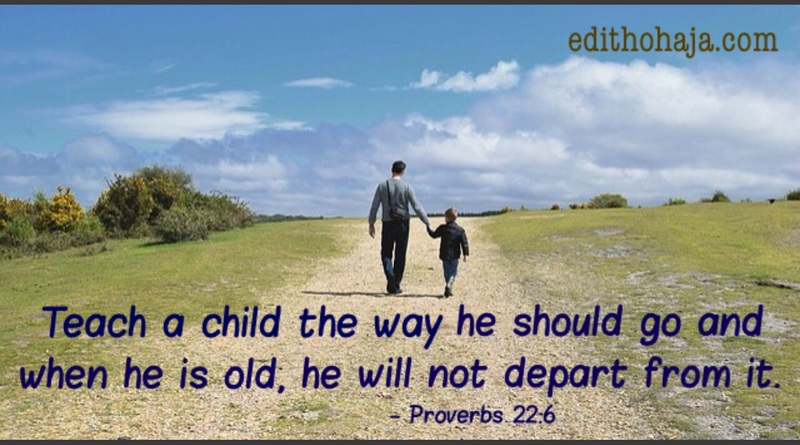 Teach your child the ways of the lord even in time past they won't depart from His ways. In Africa parents are encouraged not to spare the rod and spoil the child.This method continues to work from generation to generation (i should know).All these are aimed at fulfilling the will of God and making the individual a better person. Lol. UN planning to stop children from going to church and some govt agencies in other countries doing likewise,are all signs of the end time Ma. shoot on ma, thanks for giving us such piece. Nice one ma. May we not go astray from the right path that our parent had shown us. This is nice. I hope parent will see this too especially up coming parents. A world without the voice of compunction A world without the spirit to correct that's a world ready to doom its continuity. We need to talk and educate our children to eschew the powers of immodesty and lawlessness moving like the tsunami in our society. The children are the saints of our hope. God bless the CHILD--a Godly CHILD,a Godly world we call. Amen. Thank you Benjamin! That last bit sounded like a Children Evangelism Ministry slogan. Shalom! Amen to that. Bless you, Amarachi! As a good mother or father, you must let your child know the ways of God because that's the best way to bring up a child. This poem is lovely, ma. the poem is really educative. parents should train their children properly at their tender age so that they will not grow with a negative behaviour and become irresponsible in the society because a stitch in time saves nine. It is good to imbibe good character in kids so that when they grow up, they won’t depart from displaying it. This poem is a motivational one. Many parents experience laxity in correcting their children, this has made this generation lack moral values. Train up a child the way he should go and when he grows he will never depart from it. Spare the rod and spoil the child. Children needs discipline to become responsible people. there’s an adage that says when you train up a child in the right path, when he grows he will not depart from it. God has blessed us with kids so we should play our parts well by teaching them the ways of the lord and good morals. This poem really pointed out good reasons why parents should show their children the right path to take.when children are trained through the right way it makes them appear different from their play mates.It is very important that parents teach their kids in the right way,because they will certainly not be with them every moment of their life. Clearly, Scriptures teaches that training children to know and obey God is the basis for pleasing Him and living victoriously in his grace. Discipline is an integral part of raising Godly children, for we know that "Lord disciplines those He loves" (proverbs 3:12). Hence, parents should have the same zeal for teaching their children the right way. The way of the lord is divine, I pray in his grace, he will help us teach our children the right path to pursue which they will never depart from.